Yum. Those look so fresh and delicious. Peppers and ranch are a favorite snack here. Happy WW! I love green peppers. Yummy! Those are some big, beautiful peppers! What a great capture! Looks like you have quite the little helper in the kitchen (or if it's like our house, someone to run off with the food)! WOW! Those look great!! Ours are always a lot smaller. mmm Those beautiful peppers look so good!! Look how shiny and huge those things are! I love this photos. so fresh and inviting to taste. Yum!! 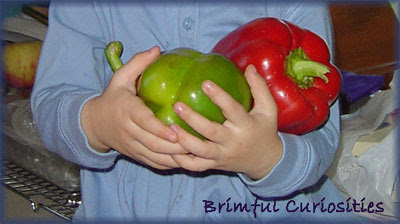 i love the bright colors of those peppers! So bright and colorful! I like pics of kids with food or helping in the kitchen.